Paris St-Germain are 15 points clear at the top of Ligue 1 after an emphatic victory over bottom club Troyes at an emotional Parc des Princes. There was a minute's silence while fans and players sang La Marseillaise - the French national anthem - before PSG's first home game since 130 people were killed in the Paris attacks. PSG scored through Edinson Cavani, Zlatan Ibrahimovic's penalty, Layvin Kurzawa and Jean-Kevin Augustin. Thomas Ayasse got Troyes' consolation. The win took PSG 16 points clear at the top of the table but their lead was cut to 15 points later in the day when newly-promoted Angers defeated Lille 2-0 to go second. PSG visit Angers on Tuesday. Laurent Blanc's side are well placed to claim a fourth successive league title after nearest rivals Lyon slipped to a 4-2 home defeat against Montpellier on Friday. A ninth successive Ligue 1 win leaves PSG with 41 points from a possible 45, while Troyes remain bottom of the table, without a win in 15 league games and nine points from safety. PSG had warned fans to expect "exceptional security measures" before the game in the wake of the 13 November attacks. Away fans are banned from top-flight matches in France until mid-December. PSG said it was "imperative" home fans attending Saturday's game brought at least one form of identification "in order to make it through the security checks on the way into the ground". Paris St-Germain boss Laurent Blanc: "There are still points on offer between now and the halfway point of the season and we want to get as many as possible. "We played a number of young players tonight because we have a lot of matches every three days at the moment. We have a quality squad, so you need to use it at times like this." Paris St-Germain forward Zlatan Ibrahimovic: "Before the match was very emotional and we did what we could to pay homage to the victims. It's never easy to then go and play a football match, but we are footballers and have to do what we do best: play football." Match ends, Paris Saint-Germain 4, Troyes 1. Second Half ends, Paris Saint-Germain 4, Troyes 1. Johan Martial (Troyes) wins a free kick in the defensive half. Goal! 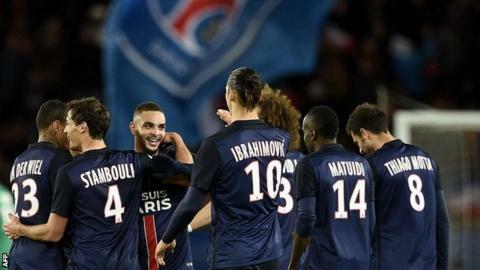 Paris Saint-Germain 4, Troyes 1. Thomas Ayasse (Troyes) right footed shot from outside the box to the top left corner. Assisted by Jimmy Cabot. Offside, Paris Saint-Germain. Thiago Motta tries a through ball, but Zlatan Ibrahimovic is caught offside. Goal! Paris Saint-Germain 4, Troyes 0. Jean-Kevin Augustin (Paris Saint-Germain) right footed shot from outside the box to the centre of the goal. Assisted by Ángel Di María. Corner, Paris Saint-Germain. Conceded by Matthieu Saunier. Attempt blocked. Zlatan Ibrahimovic (Paris Saint-Germain) right footed shot from outside the box is blocked. Jean-Kevin Augustin (Paris Saint-Germain) wins a free kick in the attacking half. Foul by Jimmy Cabot (Troyes). Substitution, Paris Saint-Germain. Jean-Kevin Augustin replaces Edinson Cavani. Corner, Paris Saint-Germain. Conceded by Paul Bernardoni. Attempt saved. Layvin Kurzawa (Paris Saint-Germain) left footed shot from the centre of the box is saved in the centre of the goal. Assisted by Ángel Di María. Substitution, Troyes. Jimmy Cabot replaces Fabien Camus. Attempt missed. Ángel Di María (Paris Saint-Germain) left footed shot from outside the box is too high. Assisted by Thiago Motta. Corner, Paris Saint-Germain. Conceded by Jonathan Pereira. Attempt blocked. Zlatan Ibrahimovic (Paris Saint-Germain) left footed shot from the left side of the box is blocked. Assisted by Blaise Matuidi. Goal! Paris Saint-Germain 3, Troyes 0. Layvin Kurzawa (Paris Saint-Germain) left footed shot from outside the box to the bottom right corner. Substitution, Troyes. Mouhamadou Dabo replaces Chris Mavinga. Substitution, Paris Saint-Germain. Blaise Matuidi replaces Lucas Moura. Substitution, Paris Saint-Germain. Thiago Motta replaces Adrien Rabiot. Attempt missed. Yoann Court (Troyes) left footed shot from outside the box misses to the left. Assisted by Stéphane Darbion. Substitution, Troyes. Yoann Court replaces Benjamin Nivet. Attempt missed. Edinson Cavani (Paris Saint-Germain) right footed shot from the left side of the box is just a bit too high. Assisted by Zlatan Ibrahimovic. Goal! Paris Saint-Germain 2, Troyes 0. Zlatan Ibrahimovic (Paris Saint-Germain) converts the penalty with a right footed shot to the bottom right corner. Penalty Paris Saint-Germain. Lucas Moura draws a foul in the penalty area. Penalty conceded by Chris Mavinga (Troyes) after a foul in the penalty area. Attempt saved. Lucas Moura (Paris Saint-Germain) left footed shot from the centre of the box is saved in the centre of the goal. Assisted by Zlatan Ibrahimovic. Attempt missed. Lucas Moura (Paris Saint-Germain) right footed shot from the centre of the box misses to the left. Assisted by Ángel Di María with a cross. Attempt missed. Lucas Moura (Paris Saint-Germain) right footed shot from outside the box is close, but misses to the left. Assisted by Layvin Kurzawa. Foul by Corentin Jean (Troyes). Foul by Edinson Cavani (Paris Saint-Germain). Jessy Pi (Troyes) wins a free kick in the attacking half. Second Half begins Paris Saint-Germain 1, Troyes 0. First Half ends, Paris Saint-Germain 1, Troyes 0. Attempt missed. Lucas Moura (Paris Saint-Germain) header from the centre of the box misses to the right. Assisted by Ángel Di María with a cross following a corner. Attempt saved. Edinson Cavani (Paris Saint-Germain) left footed shot from the left side of the box is saved in the top centre of the goal. Assisted by Ángel Di María.